According to the report, the BLM permits 12.4 million animal unit months (AUM’s) but only about 9 million AUM’s were billed in 2012 and the average during recent years is only about 8 million AUM’s. An AUM is the unit of measure for livestock grazing and equates to forage needed to support one cow/calf pair or five ewe sheep and their lambs for one month. The rate for an AUM in 2012 was $1.35 which, in terms of inflation, is lower than it has ever been. As of 2011, the BLM has about 18,700 active permits on more than 21,000 allotments across 155 million acres. For the 17 Western states, livestock receipts in 2012 totaled about $70 billion, representing 46 percent of all U.S. livestock receipts, and about 1 percent of the combined gross domestic product for these States. Direct economic output attributable to public land forage for FY 2012 was estimated to be approximately $808 million dollars – or about 1.6% of cattle and calves and sheep and lamb receipts in the 17 Western states. The report goes on to rationalize the reason for the low rates as compared to private grazing lands where the market price was $16.80/AUM in 2011. The lands are not as productive as private lands, private landlords may provide and maintain other amenities such as water developments of fences for the ranchers. Unfortunately, even with the absurdly low rates, ranchers routinely ignore fence and water development maintenance. On nearly every trip to the field I have made over the years I witness cattle inside poorly maintained exclosures or sign that they have been there. I also routinely witness water troughs that completely fail or that leak onto the ground creating a stinking, muddy, manure and urine filled mire that is ideal habitat for West Nile Virus infected mosquitos and pollute other surface waters and groundwater. These same troughs also lack the required bird escape ladders and sometimes are filled with dead wildlife. The report does admit that the absurdly low grazing rates “creates an incentive to use federal forage before using other forage sources and perhaps to use federal grazing allotments more intensively than privately owned rangeland.” This is clearly evident when you visit many western grazing allotments. Often, private rangelands are in considerably better condition than our public lands, especially in drought years when permittees often increase their use of public lands except for the rare case when the BLM recognizes the drought conditions. Even then, since there is a large discrepancy between the number of AUMs permitted and the actual number of AUMs used, any cuts to grazing during drought years are only imaginary and use increases over previous years anyway. 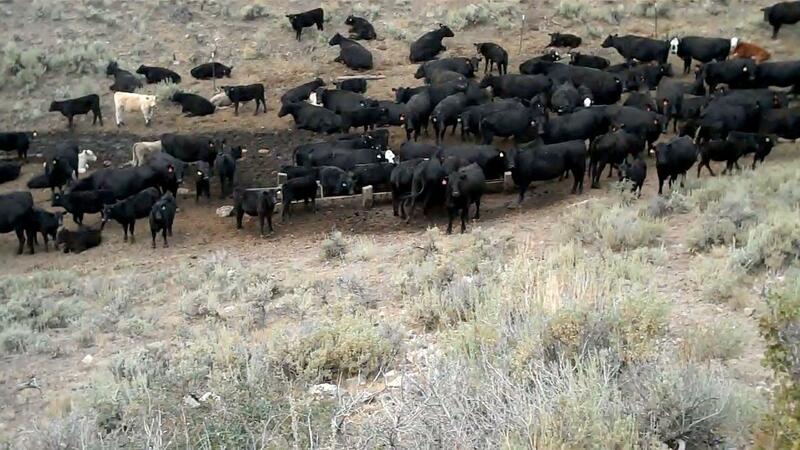 This phenomena is occurring this year in parts of Idaho where the BLM and the USFS have failed to make any significant cuts to grazing during a severe drought. The report has a curious error though. A chart contained in the appendix shows the inflation adjusted grazing fee but calculates the value in 2012 dollars incorrectly. Here is the correct data with additional years and data for the USFS which is part of the Department of Agriculture not the Department of Interior. Source: Grazing Fees: Overview and Issues. Congressional Research Service. June 19, 2012; Page 2-33. 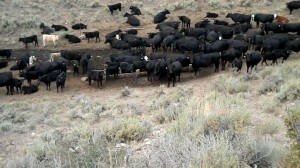 Study of Fees for Grazing Livestock on Federal Lands. 1977. DOI and USDA. Nominal fees adjusted for inflation using the CPI-U. I can accept not subsidizing beef prices and ranchers via these programs. KEN- any way to merge this BLM info with the same AUM / dollar data from the Forest Service / where I live, in NW Wyoming, you are likely to see more summer cattle on forest land, not BLM . I consider them two halves of the same apple ,rather than an apple and an orange. The number rattling around in my head is that less than 3.5 percent of American cattle ever set foot on public land during their life. In January of this year the USDA reported 89.3 million cattle in the USA, the lowest live cattle count since 1952 , due to the widespread drought in the southern states where there is no public land graze to speak of. I’ve updated the post to show USFS data. I tried to add private grazing fees as well but I could not find a consistent source of data. What is shows is that grazing fees on BLM lands haven’t been as low as they are now since 1957 and the grazing fee on USFS lands have never been this low. Sad fact is, you have to actually live out here (or visit often) to relate to what is TOO often, a depressing situation when it comes to public lands grazing and the “management” of those lands. So, is there a Top Ten List of the biggest Ranchers and how many cattle they graze at our expense. And how much $$ they are worth?? I understand the comparison you are attempting to make and support the general thesis of you piece. But, your comparison of 372,000 jobs and $45M in economic benefit from Department of Interior recreation lands is a bit distorted. Do recall that Department of Interior facilities and responsibilities include lots of urban lands from the Washington DC Mall, to Ford’s Theatre and Rock Creek Park in our nation’s capital, to places like Bull Run and Gettysburg battlefields, to the Statue of Liberty and Alcatraz, and the Alibates Flint Quarries of Texas, as well as the many natural resource based national parks and monuments. Of course, many of these charge entrance fees, and have visitor facilities and concessions (operated by contractors, but the government gets a cut). And, those 17,000 jobs in the timber/grazing sector are concentrated in just a few of those Western states, and are some of the better paying jobs with benefits, serving as stable cornerstone employment supporting communities. And, yeah, I agree livestock degrade range and forest lands and watersheds in very harmful ways, and we should find a way of phasing it out. Almost forgot, historic sailing vessels at ports around the US, like the Balclutha in San Francisco, or the 21 properties that comprise the New York Harbor NP facilities that host 12 million visitors a year, many for a fee upwards of $5/head. I was out in the Sandwash Basin of NW Colorado, an area that is heavily grazed by sheep. Most of it looks like a moonscape. I saw a few piles of Tamarisk. I assumed that by the direction of BLM they were being removed (probably by a private contractor for a huge fee) from a gully that had a pothole’s worth of water in it. I laughed at the irony of it How ludicrous to get “worked up” over a few Tamarisk while at the same time allowing the incredible devastation and degradation from livestock grazing to continue on this allotment. Ken where do you get only 17,000 jobs? There are huge ranches that offer horse back riding,pack trips,guided hunts etc. Are you taking into accout all the trickle down jobs, trucking,grocery stores,rail commerce, etc the list is endless. Also livestock people recreate and agriculture is one in the same. Ken you depend on reports. To me most reports are biased and only suit the needs of a group who is for or against thier agenda. Typical response from you. The facts don’t fit your preconceived notions, just say they’re biased and move on. What is Ken supposed to rely on if not reports? He also does a lot of field work too. I suppose you think that is biased as well. Regarding Robert R’s derision of using ” reports” to make educated responses. Most if not all those ” reports” are sourced by the federal Dept. of Agriculture or their ancillarys in the States. as such , ag reporting is almost always slanted in favor of the producer, the crop, and the economics. Always. Chances are Robert R the truth if it could be snapshot would like be a lot more unfavorable to your way of life and alleged overall contribution to the planet. The Ag Reporting cabal is one of the biggest smoke mirror and shell games that I am aware of, once you get away from the sale ring tallies and commodity trading pits. I consider Ag Reporting to be an oxymoron more often than not. Like when US Fish and Wildlife reports on 45 verified cattle kills in all of Wyoming, but the ” Ag Reporters” claim it’s north of 2500 probable depredations , a discrepancy between the two reporters of , oh , say five thousand percent give or take. Seems to me it is important to understand the content of the reports, regardless of who prepares them. I have trouble with this one, as regards the number of jobs allegedly supported/created as a result of BLM grazing policy. First there are the direct government jobs of federal employees, and federal contractors (That part is easy). Second, there are the jobs created indirectly by virtue of the grazed lands product that is produced, but it is not clear what that actually entails. If cattle raised on federal grazing lands for five months or so then go on to slaughter or future reproduction of more cattle, how are those jobs accounted for? Does include the riders to round them up, truckers to feedlot, auction folks, brokers or other middlemen, and those who slaughter the beef, USDA inspectors, and the butcher in the supermarket who carves stuff up and sticks meat in packages? Does it include the augmentation of private livestock operations? By that, I mean if there were no subsidized public lands livestock grazing on public lands, would some of these operations simply not be profitable and cease altogether? So, then how many jobs would be lost, from the local communities from the hardware store/co-op that sells barbed wire and fenceposts to the truck dealer and auto/heavy equipment repair shop, to the local vet that services the industry. Another way of asking the question is if public lands grazing stops, how many jobs -direct or indirect- would be lost to local economies? How many would be offset or created if these became recreational lands (I suspect some but not all would not generate a lot of interest because they are not the kinds of lands most folks like to visit). I do not believe this aspect is covered at all in the grazing statistic, though Ken would like to portray it as a simple trade-off. On the other hand, the recreational stuff would seem to be a bit easier to develop and assign business job multipliers. It’s complicated, and some advocates either consciously want to ignore the complexities, or are not analytically inclined enough to attempt to understand it because it clouds the desired message. Oh but wait, WM, you rushed right through the list of things that happen that cause a financial windfall related to the cattle/sheep grazing desertification process. How about the wildlife services to start with? The funding of payroll and all contingent costs (such trucks, guns, ammo, traps, detectors) for the killing of everything that looks like a predator on every range in the United States – well that is a pretty tidy sum. Then there is the cost of the wild horse and burro roundups – add on a couple of mil there. Then the long and short term holding, the hay, the vets, contractors etc etc that handle the horses. Another whooping tidy bit of millions of tax payer dollars. I know you intended sarcasm. I, on the other hand, was just identifying jobs in the West that come from federal programs, and you are right,…but they are jobs, and purchases of goods and services from contractors. I would say, for example, places like Burns, OR would dry up and wither away without Federal jobs, as would Orofino, ID. And, states don’t want to loose jobs. And, by the way, I don’t support public lands grazing of cattle or the wild horse/burro program. If you have read my posts here you would know that. But, I do believe it is important to point out the complexities of these things, which others simply avoid discussing because it dilutes their message. WM,sorry but if you pay taxes you DO support public lands grazing and the WHB program, which costs by some figures I’ve seen at minimum $120K PER DAY, right now. The grazing subsidy loses over $100 million annually as well (some say twice that), so we all pay to run the BLM program, pay to remove protected species from their designated lands, pay to subsidize domestic livestock overgrazing those same lands, pay for habitat restoration in the aftermath, and we pay a premium at the grocery store when we buy beef from the USA. Everyone seems to be gaining but the taxpayers who support this house of cards, willingly or not. We are all complicit in supporting this sorry situation. It is the recent Nevada NACO lawsuit against the BLM (Feb/2014) that is demanding our wild horses in holding be destroyed. I agree that this is the proper way to ask the question; however, your response implies that you expect it would be many more than 17,000 (accounting for indirect impacts). But you’re failing to consider the notion of ‘replaceability’. In the current case, we can consider replaceability by asking what might be done with said lands in lieu of cattle grazing? In this case, we might expect increases in recreation (including hunting, guiding, backpacking, etc. ), or in some instances mining or oil and gas development. The money and jobs brought to such areas via these activities would replace some (or all) of the existing jobs, and have indirect benefits of their own. Yes, my purpose is to be “intellectually honest.” Having spent time in areas where natural resources once drove local economies, and now do not, “replacability” is certainly a core issue. For example, the coastal ranges of WA and OR were once logged of their old growth timber. The economies were strong, but now those communities are shells of their former glory of 30 years ago, barely hanging on, with lots of poverty (think Aberdeen or Forks, WA; Sweethome or Coos Bay, OR; Crescent City, CA; or take your pick there are dozens of them). There is no “replacement,” just lots of hard luck stories and people living their lives on the edge of poverty and crime, in houses they cannot sell because there are no buyers. In the case of Eastern OR (don’t know whether you have been there), much is high desert with dominant vegetation sage, juniper and grasses, and no timber, and seasonally the climate is not hospitable – hot and dry in summer, and cold, and windy and dry in winter. These are representative of some of the range lands we speak of here (along with NV, ID, MT etc.). They go on for miles and miles. This is not the kind of land that people travel to for recreation very much (some deer hunting, maybe). Water is scarce; vistas that most find visually stimulating are very rare; support services like gas stations, restaurants and motels near non-existent. The biomass densities are low and cover for prey and/or hunters is scarce. About the only thing that will grow here seasonally is grass – and some humans thought they could make a living there, and have taken advantage of those grasses to feed their cattle for a few months at subsidized federal government expense. Not so good for any type of recreation, in my view. One example I used is Burns, OR, where most jobs are federal – BLM, FS, a regional postal facility and other services that are needed by residents in that sparsely populated part of the state. That is also the closest place to go for fencing, feed and groceries for those who live up to a hundred miles away. We aren’t even talking a very large town, either, maybe 3,000 population. People, other than the full time residents, just pass thru, some headed for the Malhuer Wildlife Refuge (good birding in the alkalai flats, rushes and a large and very shallow lake, but still desolate and inhospitable most of the year, and then there is the wind). Nobody will be building condos or golf courses anywhere around there -ever. With what is public lands grazing “replaced” on these lands? I would suggest not many alternative jobs, but it will be better for the land and the wildlife there if the cows are gone. In some places the existing “quality” of the recreational experience might be improved – I think it would be great not to see cows in the foreground of my photos of the Sawtooths near Stanley, ID, or have to dodge cow pies on the trails into parts of the Wind River Range. Won’t be more recreation or more “replacement” jobs in those areas if the cows go away though, IMHO. And, let me footnote this, with the “ecotourism” argument and wolf watching. It will never be the kind of economic incentive of the phenomenon at Yellowstone, and the economic numbers espoused by Dr. Duffield at something like $45M/year. The draw just isn’t there. So, if someone argues wolf tourism will add many jobs to places like Joseph or Enterprise, OR in the NE part of the state, I would suggest it is over-reaching in the conclusion, especially if it displaces the folks running cows there. Sorry for rambling geographically, but this scenario is repeated in the really arid areas of the West, and I didn’t even mention NV, NM or AZ. Putting a stop to public lands grazing will be a big and contentious political challenge, even though it is not a significant contributor to national cattle production, or total number of jobs. Good point about mining and oil and gas, as well as the boom-bust cycles that often accompany NR exploitation. However, I don’t see where public lands cattle grazing has buffered communities from the type of poverty you describe. Indeed, rural poverty (and flight to urban areas) is a growing problem throughout the country–including here in the Midwest where we have abundant water, a favorable climate, and some of the best soil in the world. Now consider whether it is cost-effective to maintain roads, hospitals, fences, and other infrastructure to support very small communities that exist on what you yourself have describes as “..high desert with dominant vegetation sage, juniper and grasses, and no timber, and seasonally the climate is not hospitable.” Given the fiscal problems our nation faces, is it really in the best interest of our country to support economically unsustainable communities with continual federal subsidies? Back to replaceability: If we do believe that such communities should continue to be heavily subsidized, we might ask what types of activities are appropriate for subsidy? So for example–the government might chose to offer subsidies for the production of native ungulates versus cows. Or they might choose to focus on developing recreational opportunities on some lands. You’ve cast eastern Oregon as a recreational desert. I won’t comment as I don’t know the area; however, I do know southern Utah and northern Arizona (both more arid than Oregon), and I know of some already existing tourist attractions that could be developed (e.g., the so called “wave” in Arizona). The fundamental point is this: we’re already talking about an unprofitable economic activity. Why not determine what types of activities might make better use of the land and then choose to subsidize them, thereby replacing the unprofitable and ecological damaging grazing activities? It won’t work everywhere, but it doesn’t have to. In Idaho, most of the rural areas that yell the most about public land grazing and how important it is, get by far their most income from transfer payments (social security, retirement, and government employment) than livestock. Throughout the West, many of the down in the heels places were told and told and told that the resource usage was not sustainable. I mean the trees were being cut on a non-sustainable basis under very optimistic assumptions and also capital equipment was more and more replacing labor. No doubt many blame environmentalists not the companies that screwed them, but that has become so typical — people with attitudes that harm their self-interest. Parts of Southern UT have those jaw dropper vistas and interesting landforms that are absent in much of Southeastern OR (Perhaps that is why there are no NP’s and few Monuments there). Eastern WA has some of its own visual appeal, punctuated by the spectacular Columbia River and the huge Basin itself (same weather and lack of landscape water/precipitation as the desolate parts of Eastern OR, however and makes much of land unsuitable for anything except grazing cows or leaving it in its natural state). I don’t know about NV or other places in the Southwest, but I would suggest there is no shortage of rather boring landscape (and delicate erodible land forms) and hostile environment most of the year. I have spent some time in the Escalante – Staircase country and on the Kaiparowitz Plateau (SE of Bryce Canyon NP), which is brutal country with mildly good vistas in spots, and no water. It will never be a recreational destination of any great magnitude (the Mormons figured out it wasn’t good to farm, too, but I found it an interesting place to visit – but only once). Canyonlands is the exception (witness the recent development in Moab), but there is still a paucity of services in much of that country, even less without the ranching, including that on public lands. There are parts of CO that will never serve much recreational purpose, though some spots seem usable for scattered cows, as well. In the early-’60’s the think tank Resources for the Future, undertook a study to look at “The Use of Land” focusing on how increasing population, agriculture, timber, grazing etc., would change the face of America over a planning horizon of forty years. The authors were Marion Clawson and R. Burnell Held. I had the pleasure of knowing Bernie when I was in graduate school at Colorado State, and took a couple classes from him. They did some landform analysis of the type you suggest, though on a much larger macro scale, looking at economic value of change. I wonder what Bernie would say about their work now that we are 13 years beyond their year 2000 planning horizon, with accumulated changes and impacts from a much larger population, and continuation of practices like public lands grazing (abuses which WWP regularly and successfully points out when litigating against BLM and FS to meet statutory obligations of the resource planning laws passed in the mid-1970’s (RFF, if I recall, was behind the drafting of some of those). The cost of infrastructure to support low density development has always been a big concern, but even greater today for the reasons you raise. All those rural county roads, power lines that run for miles to serve a few houses, ranches or farms (incidentally I just had occasion to price the cost of running electrical power for a family member who was selling some farm land in MT – it runs about $100K+/mile for wire and poles, even more for buried cable, according to the Beartooth Public Utility District that serves that part of the state). I think as long as there are paved (or even gravel) road systems that serve to get people from one part of a state to another, or to an adjacent state, and are funded with gas taxes or state/county taxes some of these communities will exist (subsidized), though on a much smaller scale or longer distances between if federal jobs go away. Does the adjacent land, once used more intensively in some of these areas, go back to its natural state? Is there economic value in this? Does it make a difference except to those who want to improve wildlands, and are WE really in the majority? Good points. This summer I intended two conferences where well-known scientists gave keynotes about global climate change. Both cited a study predicting a 700% increase risk of forest fires in western Colorado (same study predicted increased risk throughout much of the West, though I’ll admit I can’t recall the time window). It made me wonder about all of the resources (i.e., local, state and federal tax dollars) used to protect small communities in these areas…and how we should expect these to increase. Condensing development in larger, but higher-density towns would seem wise, though it will never happen, politically. (And anyway, people live in the West to get away from people.) Yet another cost of maintaining and supporting small, “frontier” communities. JB, I’ve pondered this often, but one factor not being considered here is the savings of money not spent on public lands management programs that are bleeding us while damaging ecosystems yet simultaneously subsidizing private profits. Nor the costs spent rehabilitating damaged riparian corridors, for one example, or wildlife losses due to barbed wire, for another. Or the out-of-scale increased risks of fire when cheatgrass takes over, for yet another. Just looking at jobs/no jobs isn’t a balanced scenario when there are exorbitant ongoing costs which could be reduced or avoided by a change in approach. If as a society we want to subsidize ranching, we can surely do it less expensively, and with less long-term damage, than what we do now. If we took the 3 or 4% of all domestic livestock off public lands grazing and confined them in less sensitive congregations (as we do with “wild” horses as a policy now), it surely couldn’t cost more than the hundreds of millions we lose every year with our current structure. Heck we taxpayers might even be able to afford the beef we helped pay to feed! In my view it boils down to deciding how much we are willing to keep losing in order to subsidize private livestock businesses. The costs/benefits picture see now is utterly unsustainable for we, the people. Robert R, to follow up on Ralph’s comment “What is Ken supposed to rely on if not reports?”: if “to you” most reports are biased, what numbers would you cite instead? Why do you think your numbers are less biased than those Ken is using? Mal even you and I are biased and we all have are own opinions and Ken can stand up for himself. Sure he can, he’s got data to back his argument up. Do you? I agree with Ida that Americans (c’est moi) will never willingly give up beef completely. But if grazing is eliminated on public lands, it would reduce the supply of beef by less than 4%. Assuming that would increase the price of beef proportionally, I’m quite willing to pay 4% more for it if I knew that grazing was no longer damaging my public lands. Even short of eliminating grazing on public lands completely, every AU removed from degraded habitat helps. That’s why I’ve given hundreds of dollars to Western Watersheds Project, with which this blog is closely associated as most of you know. By forcing land management agencies to follow their own rules, WWP has helped remove cattle and sheep from tens of thousands of acres of public land, and reduce grazing pressure on hundreds of thousands of acres more. If the laws and regs on the books were implemented, and if grazing fees reflected market value, this problem would take care of itself in a matter of months. But in 20 years, there will be a lot less grazing on public lands, not because of concern for water, air or wildlife, but because of economics. The rich ranch owners will want a few decorative cows on the landscape, but nobody will want to be involved in the business. Ranchers are getting old, sick or divorced, and their kids have no interest in continuing on — they’ve moved to Fort Collins or Boise. It’s going to go away, we’re just trying to accelerate it. Jon Marvel is having a pipe dream, sure some ranches will go away. Farmers are getting old, sick or divorced also, if Jon’s right none of us will have anything to eat. It’s a nice pep talk. Every calf producer that is removed from federal lands means the price paid per pound will go up, the economy and grass will drive the number of ranchers. “If Jon’s right none of us will have anything to eat.” Don’t you think that’s a little hyperbolic? We’re talking about no more than 4% of the beef consumed in this country. If being old, sick and divorced is going to be the end of ranching then it will also be the end of farming. If public land ranching goes away, the quantity of food and the prices for it will not change in any perceptible way to end consumers. I think the ranchers utilizing public land for grazing should pay the same ridiculous amounts for grazing that they try to charge hunters to cross their land to access state or public land. The ranchers cash in by paying low rates to use public land for grazing and fatting up their cattle while the grass and wildlife flourish on their property, come fall the majority of available food is on the private property do to over grazing on public land. So now where is the majority of the wildlife going to go for food, thats right private untouched grazing land. and for a small few, to those of you making 6 figures the rancher will allow you to hunt his property. But dont think for a minute you can cross his property to access public land locked land. my real concern is the cheap price of our land/property to ranchers who are raking in the highest know prices of cattle! 1992 its was $1.92 per AUM currently it’s being raising to $ 1.65. What a scam! I raise cattle in the state of MO. with no subs from the Government! I can run 1 cow/calf pair on less than 3 acres, unheard of in the western states. we provide cheap property to these ranchers and receive squat in return. Another fact, many retired ranchers are releasing these properties to other ranchers at an higher price! this is Grand larceny, and nothing is being done about it. I’ve been trying to recreate your .41% figure but can’t seem to do it with those two reports – could you go into detail about how you justified the figure? I want to use the statistic but cannot unless it can survive scrutiny. Most estimates are between 1% and 2% each year (still very low). Thanks!